Sunday July 7th 1895 It was an awful hot morning. I read some after doing the morning work about two oclock it looked like rain but blew of cool without any. We took a sleep after that. We thought to go to church but it was late when we finished the evening work. read a little and went to bed early. 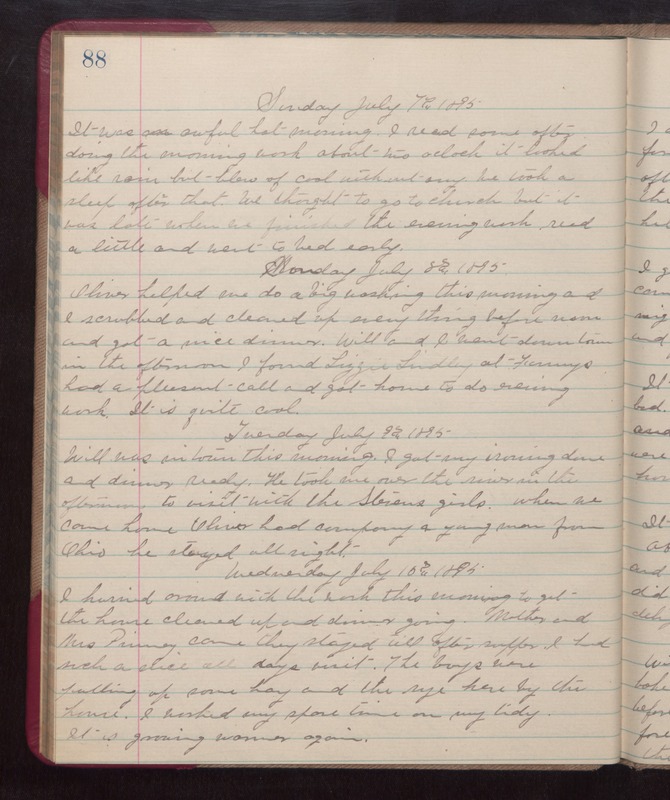 Monday July 8th 1895 Oliver helped me do a big washing this morning and I scrubbed and cleaned up every thing before noon and got a nice dinner. Will and I went down town in the afternoon. I found Lizzie Lindley at Fannys had a pleasant call and got home to do evening work. It is quite cool. Tuesday July 9th 1895 Will was in town this morning. I got my ironing done and dinner ready. He took me over the river in the afternoon to visit with the Stevens girls. when we came home Oliver had company a young man form Ohio he stayed all night. Wednesday July 10th 1895 I hurried about with the work this morning to get the house cleaned up and dinner going. Mother and Mrs Pinney came they stayed till after supper. I had such a nice all days visit. The boys were putting up some hay and the rye here by the home. I worked my spare time on my tidy. It is growing warmer again.